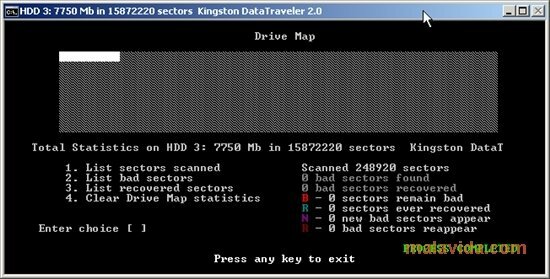 After the continuous use of a storage device it takes its toll, this is the case with the hard drives we have integrated in our computers. The problem arises when the hard drive is physically damaged, and we have to restore the damaged sectors. 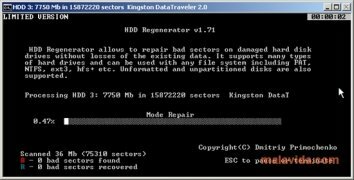 HDD Regenerator is an application that scans the surface of our hard drive in search of errors and physically damaged sectors, ignoring the system files, the file system (FAT, NTFS,...), the possible partitions and the disk's format. 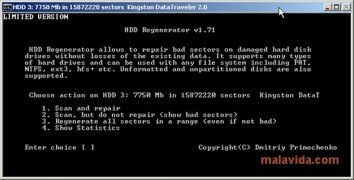 Once it detects the problems on the disk surface, the application repairs the damaged sectors (usually due to magnetic errors) without losing data, even though it's always recommendable to make a backup before repairing. There are three ways of launching this application: straight from Windows, creating a USB device or from a Boot CD/DVD. If you have had problems with your hard drive and you haven't found a feasible solution, download HDD Regenerator now. The trial version only regenerates the first damaged sector that's detected.